Interlocutor: Good, I will listen to your message and if I may, I will make some questions as you go. Eon: The age of the universe is infinitely greater than the age of each individual in each planet, and as you would say in the physical plane, everything is calculated. It's so slow, but so slow is the spiritual evolution, that sometimes the entire life of a race is not enough time for each spirit to evolve. This means that in many worlds there were many races that had been habitat of spirits and those races did not fulfill their duties… Do you understand? Eon: …and those races are now extinct and most of the spirits, which have incarnated for millennia in each Solar System, have not reached the evolution. In other words, the entire history of that race was insufficient time for those spirits to evolve as a whole... And the Earth is going in the same direction. The race "homo sapiens-sapiens", which at present is the home to some spirits, tends to be extinguished before all the spirits arrive at the 5th plane. It’s highly unlikely that the spirits that incarnate the Planet Earth would reach the 5th spiritual plane before the race is extinguished. Even if the greatest terrestrial geneticists can alter the DNA and extend the life time of the race as a whole, as a family, even then, they are not going to extend the time enough for the spirits to evolve to a level 5 in general, first because evolution itself is very slow, and secondly, because the roles, although necessary to evolve, are also huge and very heavy impediments. The question is as follows, and I will try to be as much understandable as possible in spite of the little understanding that you have of the concepts. When my dear Elohim create spirits, I am behind them, directing, marking or orienting. Those spirits are created with "defects", and they evolve precisely thanks to their learning to overcome those defects. Besides, you have a decoder so important, but so important, that you are one of the main races in the known universe whose incarnated beings decode the spirit in a very high percentage. I don’t say it so that you puff up yourself, but you have an abstract concept so great that some terrestrial philosophers with great perception, may even come to understand my way of thinking, and the meaning of life. But at some point it invades you that role of protagonist that evolutionarily stagnate you, because protagonism eagerness constitutes an insuperable obstacle for the spiritual progress. The other question, I know that is what interests you, and that many who visit your website have asked, is the origin of life. You must not have impairment in yourselves, thinking that in every world there was an extraterrestrial origin, because one might ask, if there were no extraterrestrials, then what? The Earth, as you call this planet, has its own beginning, as a primordial soup, a molecular crop that was forming bacteria… Suddenly a string of DNA makes a kind of electric shock and somehow comes to life. The first beings formed, that were half life and half not, were the viruses. Why do I say half life and half not? Because to be life there must be reproduction and the virus does not reproduce by themselves. They need to penetrate another body, a bacterium or a unicellular animal, to reproduce. But if it’s understood that the viruses are animated beings, because they reproduce in another body, then they are living beings. Many chemists and many physicists of your planet take viruses as the limit of life, as being beyond life… They are wrong… Viruses are living beings because they reproduce. But Viruses are not living beings at the height of a bacterium because they have no nucleus and need another living entity to reproduce. Well. From the primordial soup, that molecule, with a tremendous DNA chain, forms different unicellular beings… Life, by itself, tends to become more complex, because it’s done so. The Absolute is directly involved here, and not the Elohim, then certain type of life is formed with specific conditions given in each world. In this planet when that type of life was forming, it had a completely unbreathable atmosphere for you. It had a high density of carbon dioxide, sulfur and other minerals such as methane, poisonous to your current lungs. As life grew, aquatic unicellular animals were formed, because the water was the first center of life on the planet. Then multicellular animals... plants. The earth was hostile to current life. There were great methane marshes, sulfur, where a current aquatic animal could not breathe. As time passed, more complex animals were formed, much more complex. Animals in the Precambrian, Cambrian era were formed, before your dinosaurs. We are talking about 1600 million years before your current time. Then, that era finished and the formation of trilobites  started, which then became extinct – the DNA chain causes races to be extinguished –, and between 300 and 250 million years ago the great dinosaurs were formed – extinct 60 million years ago – until the anthropoids began, who already had a DNA very similar to yours and so they generated different races, until the last remaining two, the races of the Cro-Magnon and the Neanderthal, which are the ancestors of the Homo sapiens sapiens. The race of Homo sapiens-sapiens does not extinguish entirely to the race of Neanderthal, because they coexist together for thousands of years. Then three things happen: Firstly, the Homo sapiens-sapiens capture the Neanderthal females, and as they don’t have the same DNA they don’t engender children. Secondly, there were great battles and Homo sapiens-sapiens won to Neanderthal. This also decimated this race. And thirdly, the genetic code of the Neanderthal race was ending. The combination of these three factors caused the Homo sapiens-sapiens to continue on earth, that is, they are the actual human being. The Homo sapiens-sapiens, since his first link, could have up to 500,000 years. But 30,000 years ago, he began having thoughts of fear which they did not understand, and just 10,000 years ago he began to think abstractly. And about 5,000 or 6,000 of your years, the first scriptures began. But before those years, they drew in the caverns. That is, they already had abstract thoughts, because drawing is an abstract thought. A being, which you call an animal, could not draw because they would not understand what constitutes a drawing. Interlocutor: Could you synthesize the three disappearance factors of the Neanderthal race? Eon: Firstly, they breed sterile beings, in the same way as the race horse and donkey when mating, they breed mules and the mule is sterile. Secondly, great fights for territorial powers, where Homo sapiens-sapiens, for being smarter and having more battle strategies, won the battles decimating the men of Neanderthal. They did not take their females. And thirdly, the Neanderthal own genetic code, was already coming to an end. Interlocutor: The picture is complete, I perfectly understood it. Eon: But what remains in the Homo sapiens-sapiens? Eon: Exactly, discernment. You must understand that if there were no analytical mind, the reactive mind would not channel roles or engrams, because although engrams are reactive they also need an analysis. Eon: Even automatic engrams. The example you have always given, which suddenly that living being instinctively has something to fear, for example, darkness, an animal, a certain sound, even the automatic reactive mind has to reason that "something", and this reasoning starts from the analytical mind, which decodes abstract thinking. Interlocutor: But if the person is fainted, with the analytical mind disconnected, he can also record engrams. Eon: Totally. That law is not out of phase. But the person once awakened, to dramatize that, and with the proper conditions for restimulation, has to analyze it from his analytical mind. Eon: That is, it's the analytical mind which accommodates the roles of the ego, because although the ego stays in the reactive mind, it needs the analytical mind to dominate. Eon: If you pay attention to plays, where those actors have to study their roles and make excellent plays, well, that same study has to be done by that one who has the role of victim. So, he needs the analytical mind to study that role. Feeding from the analytical mind, he tries to manipulate others, and he does it from the reactive mind with the analytical mind. I reiterate the concept: he manipulates from the reactive mind with the analytical mind, because he needs discernment to try to dominate the other. Interlocutor: What level of involvement has the analytical mind in this? Eon: In fact, the analytical mind is hardly involved at all, because everything that person does is reactive. The analytical mind is just for the mere fact, for a mere anecdote, to give him discernment, because the reactive mind has no discernment. Eon: The analytical mind has a minimal role, which can hardly be taken into account. I mention this just to understand that, somehow, the reactive mind feeds from the analytical mind. It feeds it to make decisions to manipulate the other, that is, what role will manipulate him. But the analytical mind does not meet other function than this; the analytical mind is on the sidelines, only something like giving oxygen to the reactive mind to work. Interlocutor: I interrupt to ask you two questions: The first is whether the reactive mind was created by the Elohim, and the second if it's the best mechanism that could have been created. Eon: The Creation, in itself, is perfect, because it cannot contain errors. We are talking about that a very long time is needed, from the Big Bang to the Big Crunch, so that races truly dispassionate their egos. I don't want to give a certainty, because it's necessary that you also speculate. But please understand that it's very difficult, now I am only talking about the Earth, that when this planet comes to an end, the spirits who have incarnated in this race evolve as a whole. It's very difficult... time is not going to be enough. But, since there are still more than 25 billion years for the Big Crunch, even ending life on Earth, the spirits will incarnate in other planets until really getting evolved. Eon: Everything has already been calculated, so it's not going to be a lack of time. Besides, I already know it. Eon: But I reiterate that it's very difficult to achieve that raise on the Earth, very difficult. Interlocutor: Regarding the reactive mind. Could the Elohim have been wrong creating the reactive mind? I mean, if they could have made a better mechanism. Eon: Actually, the Elohim were the instructors. When saying that they created all living things, from plane 6 down, it's a truthful statement. It really was so... But I gave my consent, the OK, as you say in this physical plane. And I have actively participated in it. It's like the small of you who is in first grade and his father or mother guides his hand when he is drawing lines. Interlocutor: That is clear… Perhaps, then, the reactive mind failed somehow? Eon: The reactive mind is perfectly fulfilling its role. And I'm going to allow myself to be ironic, imitating you: I think the reactive mind is fulfilling its role fairly well…! Interlocutor: I clearly understand the irony… I want to ask you, before we continue, if a virus has spirit. Eon: All living things are animated by a spirit, but as well as the virus self-awareness is almost nonexistent, because a virus handles itself rather in a mechanical way, we could say that if the human self-awareness is 1, in a virus it could represent a 0.00000…, that is, a dot followed by nearly infinite zeros until you reach one. His reasoning is virtually zero. Interlocutor: Is that almost zero reaches also to the spirit? I mean if we can say that its spirit is also virtually zero. Eon: That's right… But anyway, it’s a law that every being should have its counterpart, to put it somehow understandable for you. Interlocutor: Does this mean that a virus also has a Thetan? I ask this because it seems a bit ridiculous to talk about the soul or Higher self of a virus. Eon: And nevertheless, that is so. Every being, I repeat, must have its reciprocity in the spiritual plane. But I mention it almost as an anecdote, because its spirit is negligible. Interlocutor: Will all beings evolve? When asked this I think of cockroaches, which do not appear to evolve at all. Eon: Probably, and I say "probably" although I already know that, in order to not advance you into the future, the cockroach, at the end of the Earth as a planet, finishes being a cockroach, because there will be not enough biological time for the cockroach to evolve. The evolution of human beings depends on how life has been developed in each location. In another world, the DNA of the cockroach has been developed in a different way. Interlocutor: Can they even have evolved to the point of making space machines as the Langar, who are aliens from the Arturo Constellation, like locusts? Eon: That's right, because there is nothing to prevent it. And in other worlds the plants will evolve. Interlocutor: What about the dinosaurs? Eon: In other planets they have evolved which you call velociraptors. They are two meters high. Interlocutor: Even making and handling spacecraft? I ask this because we always assume that to build them, they must be technologically advanced beings. Eon: Of course, but I want you to understand that they don’t look like the dinosaurs as you know them. Interlocutor: Is there a transformation? Eon: Sure, in the same way as you don’t have anything to do with the Australopithecus. In other worlds, the dinosaurs have eliminated their tail up to having nothing but a small tail, their nose has been shorten, and they no longer have it as long as you know it, they have fewer teeth, and although they still have their own characteristics, shape, scales, skin, etc., you would almost not recognize them as dinosaurs. Interlocutor: Have they visited our planet? I ask this because there are many stories of people who have seen similar beings. Interlocutor: Does a tiger also evolve to the point of being able to build spacecraft? Eon: All creatures evolve. What it happens is that they evolve in each planet. Here on the Earth, probably, and I reiterate that I say “probably” so I don’t advance you into the future, the tiger is not going to be more than a tiger and the same with the cockroach, because the biological time is limited to evolve. Interlocutor: My spirit, all spirits, before the Big Crunch, in what sophisticated organism will we incarnate? Eon: The answer is that you won’t necessarily be in sophisticated organisms. In Antares 4, for example, whose star is close to you, there are no sophisticated organisms, quite the contrary, if we compare them with you, they are weaker. And although there are more than 25 billion years for the Big Crunch, the majority of the beings that incarnate in Antares 4 are in the planes 4 and 5. So, if we were to be based by Antares 4, the evolution there, spiritually speaking, would have nearly finished… They have a system so, but so great in, solidarity, compassion…! Interlocutor: Let's see if I understood… within 25 billion years, will those who get to the spiritual plane 5, have no need to incarnate? Is that correct? Eon: They would continue incarnating to work with the few remaining in the dense planes, but there would no longer be so many inhabited worlds. Eon: No, there will be none, because there will be no need for sophisticated organisms to rise to the spiritual plane 5. The evolution is spiritual and not of physical organisms, which are merely incidental to the rise of the spirit. The important thing is the spirit, not the body that temporarily nests him. For that reason I gave the example of Antares 4, where the incarnated beings are already reaching the highest spiritual plane, but their bodies are not at all sophisticated. Even you, here on Earth, would call them, pejoratively, "common" or "vulgar". Interlocutor: I think I understood the idea. But I, within 25 billion years, as spirit, what would be my level of comprehension? Will it be almost like the Absolute? Eon: A spirit is always going to have the capacity of understanding of a spirit. The spirit evolves in compassion, abstraction. Obviously, you are going to have more understanding than now, but the understanding is not going to be a competition. The understanding is going to be an understanding of the abstract thing. And although it seems to you laughable, if you had the time to disconnect yourself from reality and be integrated into the Absolute, today, you could have that understanding that you will have within 25 billion years. Interlocutor: How can something like that be possible? Interlocutor: Is it since the spirit was created? Eon: That's right, it’s since the spirit was created. Interlocutor: Then, why do we take so long in developing it, if it already is? Why don’t we click and get it… now? Eon: Just because you don’t believe you are capable of doing it, simply because of that. Interlocutor: Then, the fault is in us. Interlocutor: Well, the first question that I have scheduled is a bit unusual… Is the Absolute infallible? Interlocutor: Is the answer so categorical? Interlocutor: Was your presence here already planned or was it a new fact? EON: It was already written, of course. It could not have been any other way. Interlocutor: You said that the Creation is like a Moebius strip. In other words, does the Moebius strip covers from Big Bang to Big Crunch or all infinite Big Bangs to Big Crunches? Eon: The Moebius strip covers each of the Big Bang to Big Crunch in an independent manner. Interlocutor: Are they completely separated from one another? Interlocutor: The question, then, is whether the Creation being like a Moebius strip – let's talk about this creation – is continuous, when it gets to the end, namely the Big Crunch, if the evolution starts over again from the bottom. I mean if it’s a continuous evolution - involution - evolution - involution. Eon: I respond: This Creation, in this universe, and at this moment in which you are living, from the Big Bang to the Big Crunch, for me, is an eternal present. Everything is happening at once. 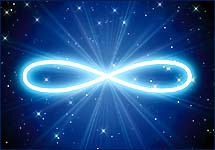 As an eternal present, the Moebius strip has no end, and those who go to a distant future may, through a dimensional hole, return again at the beginning of the past. When that "horse herd" as we call the evolution, reaches its goal and together with the Big Crunch, creates the Singularity and all the spirits become one with the Absolute, then there, everything ends. And from that Singularity, it will be a new beginning, an octave higher. And that eternal present will no longer exist. It's not that later on it could be recurring. That movie is already gone. There will be a new film with a new now. In the physical plane there are different apparatus that are suitable to go into the past, present and future, and not only in this world but in many other worlds. Interlocutor: Should we conclude the session? Eon: You can make a couple of more questions. Interlocutor: As we commonly say, I am going to "chew" your responses and in the next session I will ask again… Was that Moebius strip, that is the Creation, done by you in an instant or there was some time. Eon: It was done in an instant, because from the point of view of the Absolute, if it were some time to do something, that delay would mean limits and there is no limit for the Absolute. Interlocutor: Regarding free will... it would be the same thing having or not having free will, because if we don’t have it and everything was already written, it would be enough to have the illusion of having free will. What difference would it be? Specifically, at that precise moment in the no time Creation, did I decide it? Eon: No. You have decided what to do later. It’s something like the baby in the physical plane. The baby is not asking to be born. We are speaking from the standpoint of the physical plane and not from the standpoint of the spirit who chooses. Forget about the spiritual thing at this moment. I repeat, the baby does not choose to be born, but once he’s born and grows, he needs that his father gives him directives and later teachers do the same in the school. But when he grows, he chooses by himself. Well, it’s the same here. The spirit is created to evolve, choosing what to do in each world. Interlocutor: I don’t understand this: that instant of the Creation, does it not include everything that all the beings are going to do, the crucifixion of Jesus, the burning of Rome by Nero,...? Eon: It includes it, because from the standpoint of EON the capacity exists to perceive everything. But including does not mean that the person does not choose. If one sees it from above, and one already knows what to choose, that does not mean that one cannot choose from the standpoint of your present time. What happens is that I already know. Let me give you a good example. You have on the physical plane grandsons. Then, one of them is playing on the floor with his toys and you put a gorgeous candy one meter away and make some noise so that he sees it, and from a certain distance you watch what happens. You know what will happen. Your grandson, upon hearing the noise will look at that place, will doubt for a moment but finally he will move, will take the candy and will put it into his mouth. You already knew he was going to do all that, but you did not interfere with his free will. Well, the viewpoint of EON is that I know what you are going to do, but I don’t interfere. Interlocutor: The difference is that you see that future as now and I don’t. Interlocutor: Could we get to know the amount of successive Big Bangs in the future, for example with a 1 followed by X zeros? Eon: That’s not possible to know, because just as there are infinite probabilities, there are also infinite Big Bangs and Big Crunches. It would be a superior Moebius strip, of maximum degree. It’s futile to put zeros to it, as it is futile to try to establish with a 1 followed by zeros the amount of atoms in the universe, call them "infinity". Interlocutor: So long, EON, and thanks. Trilobites appeared in the Middle Cambrian epoch and flourished throughout the lower Paleozoic era. The last of the trilobites disappeared in the mass extinction at the end of the Permian about 250 million years ago (Wikipedia). This entry was posted at Thursday, July 02, 2009 and is filed under Dialogues with EON . You can follow any responses to this entry through the .